Umpire Ryan Additon makes his MLB debut during the Royals-Twins game on Sunday in Minnesota, joining Bill Miller's crew for two games of the KC-MIN doubleheader, serving as the first base umpire alongside HP Umpire Bill Miller, 2B Umpire Kerwin Danley, and 3B Umpire Adam Hamari for Game 1, and as the third base umpire alongside HP Umpire Ryan Blakney, 1B Umpire Danley, and 2B Umpire Hamari for Game 2. Additon is on the International League roster for the 2017 season, which is his second season in the IL and second overall in Triple-A (2016 IL). He has also worked the Gulf Coast, New York-Penn, Midwest, Florida State, Arizona Instructional, Southern, and Arizona Fall Leagues, in addition to MLB Spring Training. Additon served as the plate umpire for Tim Tebow's first Grapefruit League game this March. Additon wears the uniform number 67 at the Major League level, which was last worn by Seth Buckminster, and makes his MLB debut at the age of 31. 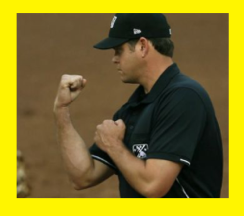 He resides in Davie, Florida, instructs at the Wendelstedt School, and is the first new fill-in umpire to make his debut during the 2017 regular season. Additon most recently worked the plate for an 18-inning International League thriller on Friday night between Columbus and Louisville (As in Minnesota, Saturday's game in Louisville was postponed). "Jim & Randy Wolf Situation" Alert: Ryan's brother Nick is a pitcher in the Korea Baseball Organization (KBO), having previously played in Minor League Baseball with the Cardinals, Orioles, and Brewers.